Rockstar Games has scaled a mountain with Grand Theft Auto V, creating the best-looking, best-sounding and, most importantly, best-playing version of gaming's most notorious franchise. Scaling one peak, however, reveals another—their cloud-piercing ambition to create a great ensemble video game drama, an epic of intersecting, interactive lives. Rockstar doesn't summit that new peak as impressively with GTA V, but in its first attempt at such an audacious feat, makes a good go of it. This is a game that feels like both the best of what anyone might expect from a GTA and the exciting, somewhat raw, uneven first try at a more interesting future for these kinds of massive open-world adventures. This is a game that works both as apotheosis and rough draft. But perhaps you'd simply like to know how it compares to GTA IV, the previous Grand Theft Auto released way back in the spring of 2008. Fine. This new one is far better-looking on console even though it is running on the same hardware, has a more interesting and varied world, has better average mission quality, is longer (possibly the same length if GTA IV's two episodic expansions are counted), is better-engineered, is less serious, but lacks a lead character as compelling as Niko Bellic. Also, V has planes. And tanks. Like six of the previous seven Grand Theft Autos from Rockstar Games, GTA V is a third-person action game set in a massive three-dimensional world. This game's world is a detailed, fictionalized recreation of Los Angeles and of archetypal nearby deserts, forests, mountains, lakes and small towns. The game's Los Santos is not real L.A. but a parody version, complete with parody radio stations, parody celebrities, and a parody Internet. A lot of it spoofs American politics and pop culture. Remember, this is the game series that has patriotic gun shops called Ammu-Nation. This is a GTA world stuffed with people who are mostly ridiculous. Almost everyone is a jerk and/or a joke. Almost everyone is a trope: dudebro financial guy, corrupt government agent, brainless starlet, mouth-breathing gamer, hardass lawyer. The game world is huge, varied, full of this kind of ridiculousness. It's there to entertain you. The most notable change to the series' formula is that there are now three protagonists for the player to control. Instead of one ambitious Tommy Vercetti or one reluctant Niko Bellic, players of GTA V can switch back and forth to steer a trio of men through the congested Los Santos and the vast Blaine County to the north. They each have their own parts to play in their interwoven narrative. The leads in the new game are all criminals but have very different lives. There's Franklin Clinton, a black South Central native who has a crappy job at a car dealership and who dreams of pulling off some grand crimes. There's Michael De Santa, a white supposedly-retired bank-robber living in the posh GTA version of Beverly Hills. He shares a home with a wife who is sleeping with the tennis instructor (and the yoga teacher), an annoying, talentless daughter who is trying to get on a TV talent show, and a lazy son who spends his days trashtalking his way through violent online video games and trolling celebrities on GTA V's version of Twitter. The third lead is Michael's former bank heist partner, the balding white trash Trevor Phillips, now a meth dealer who lives up north in a trailer and who has a perforated line and the words "cut here" tattooed across his neck. The man is almost constantly screaming. He's a psycho. Franklin, Michael and Trevor are drawn together and, soon enough, begin planning heists while also pursuing their own criminal ventures. 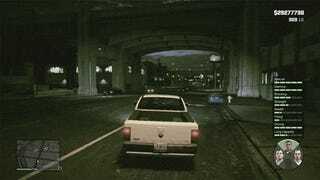 In the older Grand Theft Autos and in many of the games that copied Rockstar's open-world formula, a player got around by running around or by making their character run up to any car or truck idling in traffic or parked on the side of the road and jack it. In the new game, there's a third option. The player can hop across the map by changing characters and dropping into one of the other guys' lives. Once the game allows access to all three lead characters—and for much but not all of the rest of the game—the player can press a button on their controller to produce a circle that shows portraits of the game's three leads. After one more input by the player to switch characters, the game's camera will suddenly be reeled up into the sky, shift to another point above GTA V's huge world and then push down onto the new character the player chose to control. These switches vary in length of time, but typically take fewer than 30 seconds. Michael, Franklin and Trevor don't sit idle waiting to be controlled. Whoever the player has switched to will appear to have been going about his day. A short scene will play out before the player has control. Judging by these transitional scenes, Trevor's days seem to involve getting thrown out of places, tying men to the bottoms of piers, or stumbling around drunkenly while wearing only boots, socks and underwear. Michael's and Franklin's days are more like yours or mine (hopefully!). Players have no say as to where the character they're switching to is hanging out in the world. The destination of the character switch is a surprise, which adds a welcome new variable to the GTA formula. Character-switching winds up being similar to flipping between three TV channels. You'll know, in general, what you're going to be tuning into, but you won't know where they're at in the show until you flip. As before in GTA games, missions are sprinkled throughout the game world, Major missions—some 75 of them, despite what the in-game mission counter says—are represented by capital letters that are color-coded to indicate which of the three main characters can initiate them. The new game's pile of major sidequests—of which there are a few dozen—are also color-coded. Some quest-givers have different missions for different characters and will weave in and out of each of the three leads' threaded narratives. All of that enables GTA V to feel like the least linear game in the series, because even though it flows to certain bottleneck moments, it affords the player great liberty in choosing where to go, who to meet, what missions to go on—all with the randomized surprise of where on the map the player will be when they switch characters—to shake things up. Once missions are triggered, the game narrows the player's options by funneling them into a carefully-planned sequence of cutscenes and tasks, similar to how other Grand Theft Autos have done it. But in this game, some missions will involve two or even three playable characters. Those missions will allow players to switch characters on the fly. During missions, the character switches are as quick as a finger-snap. Some in-mission switches will be minor, involving, say, switching from Michael taking cover behind a car in a shootout with the cops to Trevor who is holding a sniper rifle while standing on a roof overlooking the firefight. Other switches are spectacular, flipping, in one instance, from a character on a train that's about to cross a bridge high above a river to a partner in crime in a boat on the river far below. The latter changes are often triggered automatically, but they nonetheless help make the missions feel more varied, less like a sequence of events and more like a juggle of multiple, simultaneous chaotic moments. Regardless of all of that, players who plumb Grand Theft Auto's deep trove of missions, side missions, hobbies, mini-games, diversions, and random events will spend much of their time playing solo as whichever character they prefer. They'll be doing what GTA players have long done: stealing a convertible, flipping radio stations, peeling down the highway, racing away from some pissed off cops and heading toward... a game of darts? A rampage? The military base where, this time, they're going to steal a fighter jet? Some GTA players ignore all the story missions and just play in the games' chaotic sandbox. Others rush through the storyline. When I play open world games, I'm a wanderer and a checklist checker-offer. In advance of my review, I played Grand Theft Auto V for the better part of a week, taking my time to explore Los Santos and Blaine County instead of just driving from mission to mission. I'm a sucker for great scenery and interesting sidequests. The game is full of both. A peer who mainlined the story and did few sidequests cleared the game in about 30 hours. Another who was racing just from story mission to story mission was moving at faster than that rate. Playing the game this way let me take the story slowly and allowed me to poke around in sidequest after sidequest. The side missions opened more of the game up, triggering new special mission types like, say, base-jumping, while improving my understanding of the characters and enhancing the richness of the game's world. Refrain from doing the sidequests and the game won't just fail to send you parachuting, but it won't take you to the peak of its highest mountain. Don't do the sidequests and you won't go jogging with a woman on the beach, you won't be trying to steal celebrities' belongings for an elderly demented British couple, you won't see how Trevor deals with immigration issues, and you won't see how, in a succession of three optional missions sprinkled throughout the game, each of the GTA V's lead characters reacts to a man who is trying to legalize marijuana. Even with the major side missions done, the game will only take you to Blaine County's sprawling wind farm once, will never take you to its prison and will ignore the game's stadiums and speedway. This is not a negative. Rather, it's a testament to how immense and full of attractions GTA V's world is. Fly over the game's spaghetti of roads and bridges and you'll see that Rockstar has, graphically, ceased to operate in visual metaphor and instead has drawn with detailed realism a metropolis and its surroundings that are full of every kind of landmark and incidental element of real world terrain that you can think of: from fictionalized versions of the Hollywood sign, the Getty Center, the Rose Bowl, LAX airport and L.A.'s famous urban drainage canals, to trailer parks, ranches, quarries, shipping docks, diners, and some place where people paint rocks in the hopes of signaling aliens. Some of GTA V's magnificent landscape may be there just for virtual sightseeing. Some of it may be used as a playground in the October-scheduled Grand Theft Auto Online, which, for starters, will use GTA V's map (and is free for anyone who buys GTA V) . GTA V's lands and bodies of water also likely hold at least a hundred secrets—specifically hidden collectibles of which I only found three in my 42 hours of playing. There is just so much in the game to explore, much of it trading off the appeal of real world geography. If the magnificence of a massive lake, the eeriness of an abandoned barn or the allure of biking up a big mountain does nothing for you, look for more fantastical game worlds to play. 1) The Menu of Mini-Games: In a way, the cities of Grand Theft Auto games are glorified menus that grant access to smaller, more focused games. Want to play a game of darts? Or a video game version of yoga? Or tennis? Or golf? Or fly planes through targets? Or use said planes to drop things on targets? Or race cars? Race boats? Do a triathalon? 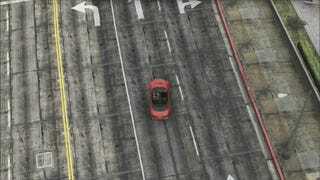 Drive to the correct spot in GTA V and you can do that stuff. Versions of some of these activities have appeared in GTA games before; others are new. Games such as tennis are complex enough to stand as small games of their own. For better or worse, though, these mini-games remain, for me, the least appealing part of the series. They are presented, more or less, dispassionately, without the snark and satire of the rest of the game's world. They are, generally, exactly what you'd expect them to be. The darts game is just that, a darts game. There's no flair, no imaginative gameplay twist, no buzz of that something special that makes a game or a game-within-a-game fun. GTA V may have more mini-games than ever before, but these activities remain one-time tries for anyone but completionists, straight-faced diversions in a game world that otherwise seems to go out of its way to get a reaction out of you. 2) The Chemistry Set: GTA's best element has always been its mad mutation of Pac-Man, its chase-or-be-chased action, set across what used to be a mostly-urban grid. The genius of 2001's GTA III and its successors was their ability to give players an ever-flowing street-level version of this action and to give players an ever-increasing amount of freedom as to how they'd play it out. If you steal a car or shoot someone in these games, the police may well come after you. Whether you flee or fight back, you'll deal with an intensifying response. The cops start driving toward you. If you're on foot, you're in for a gunfight. If you're in a car, you're in for a crazy chase. You'll either get your character killed or manage to escape, but, usually, there will be a lot of chaos along the way. In GTA V, there are up to five "star" levels of notoriety, though when you're down to zero there are actually relatively few cops around. Get to three or four stars and the police will send helicopters after you. The big change to how GTA's central cops-and-robbers system flows involves how the cops chase you. If the police see you, the mini-map in the lower lefthand corner of the screen will flash blue and red, and the cops will be all over you. Give the cops the slip, and the mini-map reverts to black and gray, but little flashing dots representing the police will buzz through the mini-map, projecting a cone that represents each cop's line of sight. What's happening there is that the cops are hunting you down. You can't stay stationary and hide. You have to move. You have to keep veering out of the line of sight until the police lose interest. The police have always been the most interesting part of GTA's chemistry set, but there have been other elements mixed in, usually tied to specific vehicles. In the past, for example, stealing a taxi allowed players to start finding passengers and taking them to their requested destinations. That returns in V. In the past, other missions might spawn after stealing a tractor trailer or police car or delivery van or fire truck. Much of that appears to have been removed for V, though the wide range of vehicles to steal remains. If you're stealing, say, a helicopter in this game, you're largely just doing it for the fun of it. GTA IV had added a cell phone to the mix and gave the player a lot of in-game friends who would call and ask to hang out. These friends were annoying. These people seemed to always want to go to bars or play pool or do any other of GTA IV's less fun activities. Each of the lead characters in GTA V has a cell phone and friends and family who call (or text or e-mail), but they rarely ask you to do anything with them. You can go to the bar with them if you'd like, but only at your prompting. So it's not vehicles or friends that play a big role in tweaking the GTA chemistry set this time around. Instead, it's money. The game runs on a much more complex economy than its predecessors and builds greatly on some property-ownership ideas introduced in Grand Theft Auto: San Andreas. In V, you can buy properties, take in weekly piles of money from those properties and even go on missions to keep that take high. Some of your property income will be affected by actions in the world. For example, the scrap yard yields a certain amount of money each week based on how many cars you've smashed in the game. More interestingly, you can play the stock market. The game runs two stock markets, one controlled locally within the game and the other whose company stock prices are, according to Rockstar, determined by how the mass of GTA V players is all playing the game. Should, for example, one type of car get stolen a lot then the stock price of the auto-maker behind it will be affected. Stocks also change prices based on missions players are going on, so it behooves players to listen to their mission-givers and, perhaps, buy a ton of stock in the company whose rival CEO you've just been asked to assassinate. 3) The Search For Stuff: It might be apostasy to purists of video game theory, but one of the most enjoyable things to do in GTA games, including this new one, is to find the next bit of non-interactive or barely-interactive content. GTA V is, in a sense, a massive treasure hunt. Like the franchise entries before it, it's got a massive world that has all kinds of things in it that the developers would like you to find but aren't going to make it easy for you to find. Well, not all of it's easy to find. Some of what's in the game is what series veterans would expect. You've got new in-game TV shows to watch. There are more than a dozen of radio stations to listen to, all with funny, satirical commercials. You can spend a few minutes in the game watching Rockstar's send-up to nearly-incoherent foreign films. The game's fake Internet is bursting with websites that spoof major clothing brands, online dating services, self-help movements and more. None of this makes GTA V more interactive, but it helps make its world more interesting. It also makes the game a time capsule as the targets of its mockery—everyone from predatory lenders to people who camp out for iPhones, everything from skinny jeans to Google Maps—may not be around or be recognizable or may simply not be annoying in the same way by the time Rockstar makes another GTA. A note about all this satire: it can be hard to take Rockstar's skewering of modern (mostly American) culture all that seriously in a game that also offers interactive first-person lapdances as well as easy knocks at idiotic things like reality shows. Some might see the old Shakespearean gesture to both the highbrow and the lowbrow in GTA V's satirical abuse of tax-and-spend liberals and its jokey presentation of pot use. But GTA has done this stuff before, and its satirical newscasts—"Weazel News: Confirming Your Prejudices"—just don't sting as much since they've stung so many times before. GTA V finds its mark and makes a piercing point when it presents some of its satire in the game's playable missions. Without spoiling it, one mission makes its point quite clearly about America's post 9/11 treatment of people who look a certain way. By being interactive, it makes the player fascinatingly complicit in what it appears to criticize. Most of GTA V's content hunt is actually not that heady. It's also rarely dull. At turn after turn, there's a new character to find or new place to visit, new thing to watch or listen to. For those who like to hunt and peck and peer at all corners of a game world, there's much here to like. 4) The Story. There's a scripted adventure to be had in these games, one with a beginning middle and end. GTA V's got that, too. That's where the ensemble comes in and that's where the game ceases to be a perfecting of what has come before it in the franchise and more of an attempt, imperfectly, to do something new. At its most basic, GTA V is a story about three men who come together to commit new crimes. Because they can't be together at all times, the game's writers and mission scripters needed to repeatedly find reasons to bring Michael, Trevor and Franklin together and then to split them up. While doing that, they needed to keep all three men interesting. Here, their success was mixed. Separately, Trevor outshines Michael and Franklin. A complete nutjob who enters the game in a way that made him immediately incorrigible and fascinating, Trevor is the right kind of crazy for a GTA. His character fits his action, overcoming a flaw in previous GTAs that made the characters that players controlled in the cutscenes (generally calm, bemused, and often reluctant men of action) feel wildly inconsistent with the ones they controlled in gameplay (generally mass murderers willing to blow up dams, drive over pedestrians and machine-gun dozens of cops). Trevor is nuts in his gameplay. He's nuts in his cutscenes. He also has weird relationships with his friends, is haunted by things that happened in his and Michael's past and, overall, is someone who is interesting to control and find out more about. Michael is, perhaps, half as interesting. His family dramas brim with potential but never achieve anything more than sitcom complexity. He's in therapy, but that is played mostly for satire. Any epiphanies the character has feel unearned. He has his own issues with his past and he has potential as a mentor to Franklin, but aside from a dalliance with a possible career change at one point in the game, he feels paint-by-numbers and lacking in surprise or meaningful development. Franklin is enriched by his friendship with Lamar, a hotheaded friend from South Central who steals scenes early and late in the game. Otherwise, though, Franklin is largely a blank, coming to life a little when exchanging e-mails with his ex-girlfriend but otherwise failing to distinguish himself as anything other than a mostly reasonable aspiring crook. 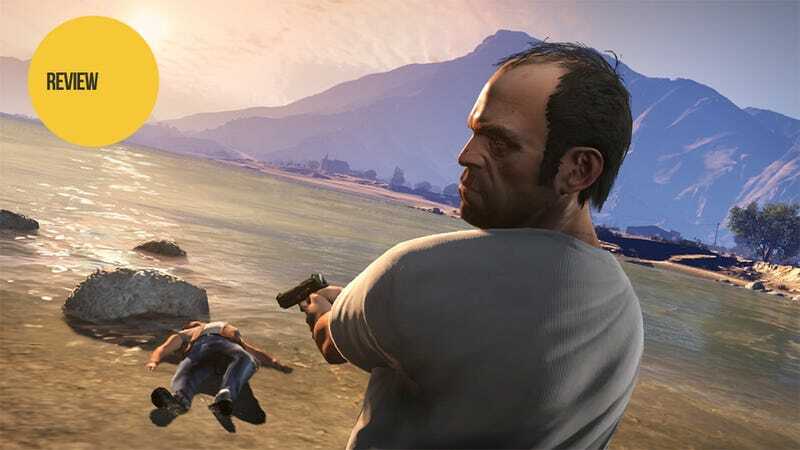 Many of Grand Theft Auto's previous protagonists were as blank or even more bereft of a memorable personality than Franklin, so it may seem unfair to knock two thirds of the leading cast. But the ensemble approach invites comparisons across that cast, and Michael and Franklin pay the price of the excellence of Trevor. Good supporting casts for all three leads at least help even things out. It's one of GTA V's best touches that switching from one character to the next also feels like changing social circles. The problem is that Michael and Franklin, when sharing a scene with Trevor, lose out. He's the one to keep your eyes on. And he's the spark of most of the interesting exchanges between the characters. Trevor also follows Cole Phelps and John Marston, two exceptionally well-written, deep, interesting leads in Rockstar games. He ranks up there with them. His two buddies do not. There are hints in the game of the storytelling power of having the player know more about what's happening with all three characters than Michael, Trevor and Franklin do. Rare as that kind of thing is in games, Rockstar at least had previously played with the gulf between character knowledge and player knowledge to great success in its and Team Bondi's 2011 L.A. Noire. For a stretch of the game, two characters have a very different understanding of something that happened in the past. The player knows the truth even as they control one of the characters who still believes a lie. There are few other examples like that in the game. But those parts of the story don't quite feel fully realized; they're glimpses of a fascinating new way to tell interactive stories, but their potential never feels sufficiently tapped. There's something undeniably potent about experiencing a story as a variety of members of an ensemble cast. For all the multi-character role-playing games out there, the concept feels largely untapped. In the writing and the mechanics of giving GTA V's lead trio missions together, Rockstar's new game feels like it is making progress, but not quite getting it, not quite justifying narratively why these guys would stick together, not quite getting the most out of what a player's relationship to three different characters would be and, simply, not quite presenting as evenly excellent a lead cast of characters as it probably would have liked to. 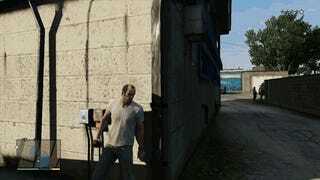 Players may find themselves occasionally yearning for the simple, single arc of GTA IV's Niko Bellic, forgetting the dull parts in a narrative that was stretched too thin. Michael, Trevor and Franklin benefit from shorter tales but would have benefitted even more from more interesting arcs and intersections. Michael, Franklin and Trevor are brought together in GTA V to go on heists. While promoting the game, Rockstar officials described a handful of malleable heist missions that would see the lead characters coming together. These missions would give the player the opportunity to tweak some variables and play the heist differently from other gamers. These capital-H Heist missions do present some of the most exciting big-action moments of the game's main storyline, but they're, surprisingly, not the game's best missions. They're not even all of the game's biggest missions. Something is off about the Heists. They may branch. They may be playable different, fun ways. But some of the choices and systems associated with them feel half-baked. The Heists present options, for example, about which henchmen to bring along. Some of these henchmen are found in the game world. They can serve roles as drivers or gunmen. The henchmen have varying skill levels and demand a different percentage of a heist's haul. Really bad henchmen will screw up part of a heist. Good ones gain stat bonuses after finishing a heist. The problem is that nearly none of that seems to matter. The consequences of using these henchmen or of repeatedly using one in order to raise their stats are nearly invisible. It seems to matter little what their take is, because players make a decent amount of money in this game no matter what. Perhaps these core specially-designated Heist missions should be seen as great bonding moments for Michael, Trevor and Franklin. Sometimes, they are. But non-Heist missions provide good moments for these characters—and some excellent interactive robberies—of their own. GTA V's credits roll for 36 minutes. For however many hours they play the game, players will feel that they are playing a game made by the amount of people it takes to keep a crawl rolling that long. The attention to detail in GTA V is likely unparalleled in any other video game. Park a car and you'll hear a few rattles as the engine cools. Finish a mission as a man is ranting behind you and stick around... that rant just might go on for a while. In comparing my experiences in some of GTA V's missions with others who've played them, we've discovered that one of us has heard lengthy in-game conversations that the other missed. It's likely that players’ memories of the GTA V and understanding of the game's events will vary because of this. Another nice touch: each of the game's three lead characters has stats associated with driving, shooting and other basic abilities that all improve with use. This helps makes controlling the game easier the more you play it. Early in the game, I kept retrying a race that was giving me fits. Each attempt didn't just help me learn the game's car physics; it made my driver, Franklin in this case, better at turning corners. Each character also has a metered special ability. Franklin's ability, which slows down time while driving, makes hairpin turns during car chases a cinch and makes evading the cops more fun and less frustrating. All of this makes GTA V feel more player-friendly than previous GTAs. This one wastes less of your time and forgives more of your small errors than any before it. It also just makes the experience of playing it more pleasant. Here's a game that is well-resourced enough to dole out long conversations between your character and his passenger while driving, changes those conversations slightly (as IV did) if you're repeating the mission, interrupts those conversations with some cursing from your passenger if you bump into traffic mid-conversation, and then picks up from that interruption to continue the scripted conversation without missing a beat. Incredible. As Rockstar has made its GTA games the studio has gradually improved things like controls and checkpoints to get to where V is, but those improvements had seemed to come paired with a taming of GTA's possibilities. Older GTA games' open-ended missions let players find creative solutions to accomplish various driving or assassination tasks. That approach gave way to missions in the likes of GTA IV that had fewer and, often, only one way to complete them. GTA V, thankfully, begins to turn against that. Some missions explicitly ask the player to plan an attack, supposedly any way the player would like to. Others simply offer an objective and leave it to the player to creatively figure out how to accomplish it. In a game so filled with scripted content, this is a welcome return to an earlier form. It's also impressive that GTA V seems to continuously find new ways to surprise its players by populating its world with small interactive events. The idea for the game's semi-random encounters comes from the pedestrian missions in GTA IV that were expanded in Rockstar's Red Dead Redemption. In both games, players would happen upon characters who had a few lines of speech and maybe a request to be transported somewhere or to have someone hunted down. GTA V is bursting with these kinds of things. Some, like the guy who is standing on his driveway looking at the clothes his enraged wife has thrown out of a window and who needs a ride out of there, seem tied to certain places on the map. Others, like the game's numerous sidewalk robberies, seemingly happen anywhere. These small incidents are generally welcome—except the robberies, which are V's worst annoyance—and can lead to good things. A man needing a ride to the airport, for example, gave Franklin a great stock tip. 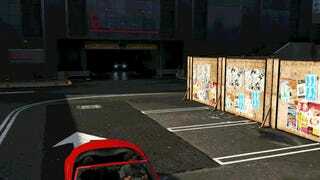 Who knows what else is hiding in Los Santos. 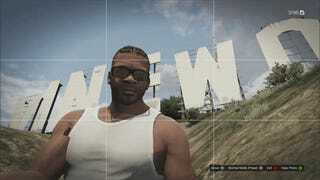 By the end of GTA V, such as there is an end to GTA V, the player will have stories to tell. One is the story of Michael, Franklin and Trevor and follows the main plotline. That one's ok. The better story to tell will be the one about all the things that happened at the margins... in the streets and alleys, off the airfields and down in the valleys. Much of that was written by Rockstar, too, and some of it was simply enabled by the marvelous chemistry set of their game world. Beyond all of this, however, is one consistent fact about so many of the best video games: they create great places in which to play. Underpinning everything else, in GTA V, Rockstar has created one of gaming's most impressive worlds. They've built on geography that anyone who has visited L.A. or hiked a trail will recognize and appreciate. Occasionally Grand Theft Auto V's main missions will push players up the map and out of the city, into the big-sky northern half of the game. In one such moment the player is controlling Trevor. He's on a motorbike. He's chasing a plane that is also heading north. Blaine County stretches as far as the eye can see, a world of possibilities. You can go to all those places you can see. You can do stuff there, probably cause some mayhem or go on a mission or just explore. It'll look good when you get there, too. Mount Chiliad looms in the distance. That's GTA V at its best—excelling at what you thought GTAs were supposed to do, while heading for the next impossibly high peak. To contact the author of this post, write to stephentotilo@kotaku.com or find him on Twitter @stephentotilo.